Amazon on Wednesday introduced the eighth-generation Kindle Oasis, its thinnest, lightest Kindle ever, with a battery life that stretches for months thanks to the included charging cover. But the e-reader comes at a pretty high price for a device that does only one thing, however well. The Kindle Oasis starts at $289.99. "It’s the most advanced Kindle we’ve ever built. 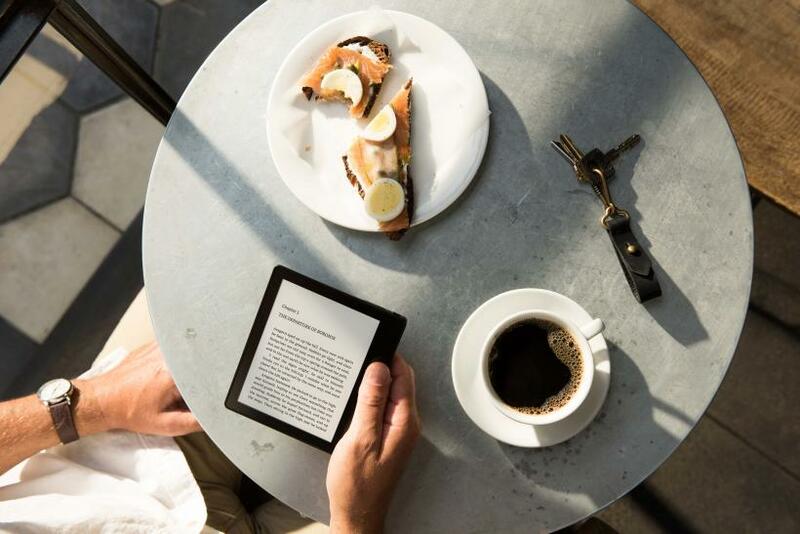 Thin and ultra-lightweight, it gets out of the way so you can lose yourself in the author’s world," said Amazon CEO and founder Jeff Bezos in a statement announcing the latest addition to the Kindle family and its notable design elements. The new Kindle design leaked online when the Chinese website Tmall published several images of the device. When Amazon released its previous high-end Kindle, the Voyage, in 2014, critics focused on the price, and the new model may face the same criticism. No matter how well the Voyage performed, it was still a $199 object designed to do just one thing at a time, vs. other tablets priced about the same or less that do more than just display e-books. Even Amazon itself has had other e-readers that did a great job for a fraction of the price -- the bare-bones Kindle, at $79.99, and the Kindle Paperwhite e-reader at $119.99. Included in Oasis' price is a leather charging cover — available in merlot, black or walnut — that snaps onto the device, bringing additional charging power to the device's built-in battery. Together the dual batteries provide months of reading time for the user. When the batteries need to be charged, the leather cover and Kindle Oasis can be charged simultaneously when plugged in. Kindle Voyage featured a flush screen more in line with the design of tablets and smartphones , and the Oasis further refines the design with a tapered back, similar to how the spine of a book fits in one's palm, that narrows to an edge that's just 3.5 mm thick. The new Paperwhite display includes 60 percent more LEDs to increase brightness, according to Amazon. The Paperwhite, Amazon's system for illuminating e-ink, display for the Kindle Oasis uses a new pattern to diffract the light across the screen for more consistent brightness. All the other features found in previous Kindle iterations, such as Whispersync, Vocabulary Builder and Smart Lookup, are included in the Kindle Oasis. Being the top-of-the-line Kindle is a mixed blessing for the Oasis. The e-reader, according to early previews from Gizmodo and the Verge, feels and performs like a premium device, but it's still only doing one thing. Considering the Paperwhite e-reader and Kindle Voyage are more than exceptional, the Kindle Oasis may be relegated to an even more niche audience. After explosive sales when e-readers first became available in 2008. the market has since stablized. The digital book market share remained at 20 percent for 2015, with no change over the last few years, according to the New York Times. In 2014, approximately 12 million e-readers were sold, down from 20 million in 2011. The Kindle Oasis is available for preorder.